I had this entire post written about tips for using various types of frames to create different moods with artwork (trust me, it was enlightening…). But since I’m the kind of person who can’t shut off her brain at night (does this happen to anyone else? ), I’ve decided to delay said post until next week. …in bed, which is very dangerous (and definitely disrupts the “I’m going to bed early to finally get a full night’s sleep” idea). THEN, I thought about my idea (well, I can’t really take credit for being the ONLY one who’s ever thought of this…) of using the Martinique wallpaper in a powder bathroom – ceiling and all, of course! THEN, I got to thinking about my own small second bathroom that’s been terribly neglected since we’ve lived here. No joke. I broke the mirror over a year ago, and it still has yet to be replaced. Serious. Neglect. THEN, I started thinking about all of the fun “wow” things I could do in that tiny…tiny…tiny bathroom. Which brings me to today’s tips and tricks – bringing the “wow” to the tiny…tiny…tiny space. Namely, the powder bathroom (I suppose you could say adding the POW in powder bath, but that may be one step beyond cheesy, so never mind.) The focus here is to create drama through the use of an unexpected element. Something that will give all who enter a moment of pause…to say “wow, I wasn’t expecting that”. Now, I don’t want to sound snotty in any way (really, I’m not trying to be…) but some of the “wow factor” elements have become pretty common place these days. I especially noticed this with while I was searching through images of interior bathrooms. They all began to look like repeats of one another. Wallpaper, tile, vessel sinks… Ugh. They all looked the same. Now, I’m not saying it’s a bad thing to use these design elements (well, to be completely honest, I’m not a huge fan of vessel sinks…), just think outside of the box and do something that will separate your idea from the rest! It gives off the “jewel box” feeling. Imagine opening up the door to a tiny treasure inside a beautiful, contained jewel box. Try using a bold stripe strategically placed to emphasize architectural details or pair a vintage wallpaper with a midcentury modern piece. Use the mirror to your advantage, and play off of the light and reflection to visually expand your space. 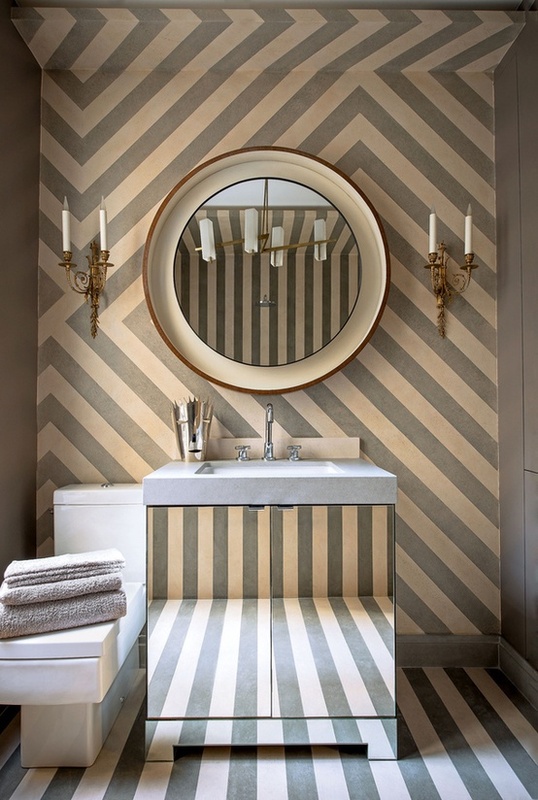 And don’t be afraid to repeat the wall’s color palette in your vanity area by using colored marble or stone. If you want to forgo the wallpaper and paint (and really commit), opt for a fun tile as a focal point. This can be done in a number of ways from tiling the entire wall to just a select portion. Think about color, size, and shape. Larger tiles can actually visually increase the size of a space. Reflection is a trick for making a small space appear larger (probably the oldest design trick in the book). Don’t limit your space-expanding ability to eye level. Remember, think outside of the box. If the dramatic walls seem a bit played out, you could opt to switch it up and add drama to your vanity instead. It’s a great way to add an element of surprise, and incorporate something unique. Now, I’ll be taking all of these ideas into consideration while I decide how to fix up my tiny, neglected bath. How about you? What are your favorite ways to add drama to a small space? Interested to see your thoughts on recycled items for decoration. Love the antique mirrors on the wall! Light and reflection without the starkness of all regular mirrors.